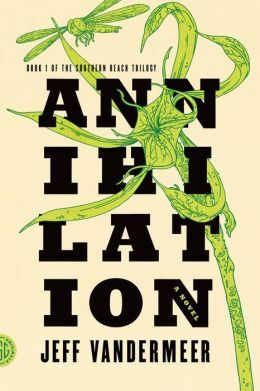 Jeff VanderMeer's Annihilation is simultaneously clever and pretentious, engaging and irritating as hell. I am by no means certain I actually liked it, but I'm definitely going to read the sequels. The story is set in an uninhabited landscape known as Area X. Details are scarce, but the characters are told that Area X first appeared a few decades earlier, an uncanny wilderness near a military base. There have been a series of expeditions into Area X, many of which ended badly—a mass suicide, inexplicable violence, death by cancer. The story opens with the arrival of the twelfth expedition, which consists of a biologist, a psychologist, a surveyor, and an anthropologist, all female. Events are narrated by the biologist, who provides readers with a nightmarish, first-person account of the doomed trip. If the above description sounds irritatingly vague, trust me: this book is not for you. This story is 95% atmosphere and ideas, 5% actual plot payoff. If you do choose to read it, I strongly encourage you to find a book group or message board or something, because you're going to have Thoughts To Share, and you're going to want somewhere to share them. I'm told Paramount intends to make this series into a movie, and my mind boggles at the thought. This novel is wildly creepy and original, but almost totally devoid of plot resolution, romance, humor, charm, or hope. Imagine if H.P. Lovecraft had written Lost, and David Lynch had directed it, and then you went ahead and subtracted 25% of any of the crowd-pleasing aspects that remained, and you'll be close to the film adaptation that Annihilation deserves.